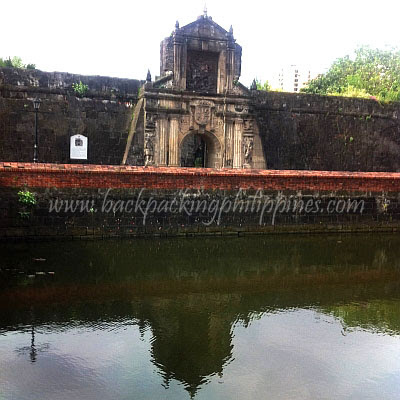 Still another post for the upcoming celebration of Rizal's 150th birth anniversary, besides a visit to Rizal Park (Luneta), another place worth your the is the historic Fort Santiago, the fortress at the mouth of Pasig River that also served as prison of Jose Rizal before his execution on December 30, 1896. Note: There will be a Rizaliana party at Fort Santiago on June 19 at 6pm with food courtesy of Illustrado and Adarna Restaurant. Free entrance if you can come in 19th century period Filipiniana costume, otherwise it's only P100 to join the party and evening of art, music, poetry and fireworks. Rizal Shrine, Jose Rizal's Prison Cell, last steps of Jose Rizal cast in brass going to Luneta, Plaza Armas, old World War II era Japanese M4 Sherman tank, cafe and souvenir shop. For a reliable and updated map of Intramuros, you can visit OpenStreetMap for reference. From LRT, the nearest station is Central Station where you can walk to the foot of Quezon Bridge to ride the Pier jeepneys from Quiapo (or also from Carriedo Station where Pier jeepneys pass by Quiapo Church) Only minimum fare required. From Makati, the easiest way is from Sen. Gil Puyat Avenue (Buendia) or Ayala Avenue is just drive towards Roxas Boulevard all the way to Anda Circle (roundabout) where you turn right to Soriano then left turn to Gen. Luna (Landmark: Palacio del Governador) just before reaching Manila Cathedral. From Quezon City, you can get there easiest (but not fastest) via Quezon Avenue then Espana, Lerma and Quiapo, cross Quezon Bridge then turn right immediately after Quezon Bridge to Riverside Drive (that pass under MacArthur and Jones Bridge). When you see Manila Cathedral, Plaza Roma and Palacio del Governador, you can get off then walk to your right going to Fort Santiago. Parking: an open car park is just beside the entrance gate of Fort Santiago with parking fee of PhP40 for cars. Intramuros, ins spite of it's tourist attraction tag, has very limited parking spaces though if you can't park there. There are parking lots at the old clam shell and also at the site of the old Ayuntamiento near Plaza Roma or street parking on General Luna and the area around Plaza Roma in front of Manila Cathedral. Warning: there still exists the stupid rule of security not allowing "big cameras" i.e. SLR/DSLR for taking pictures/photography inside Fort Santiago and Intramuros in general (unless you're a foreigner). Such medieval mind of security guards and of the Intramuros Administration tag SLRs are for professional photographers only. thanks for the info sir. sad to say I haven't visited this place eventhough I studied in Intramuros:/ I'm planning to tagged along my kids to visit the place next week. Thanks for the info. Do you know how to get permit for shooting using dlsr? Really stupid policy that no dslr inside Fort Santiago! Nice country with amazing place!